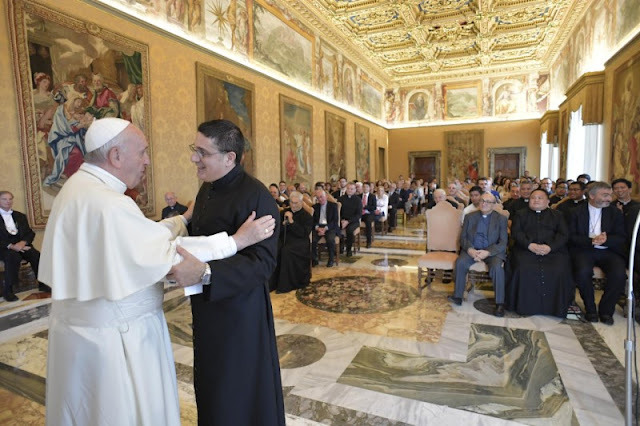 I welcome you on the occasion of your Convention, with which you celebrate the 150th anniversary of the passage to the eternal life of the Venerable Giuseppe Frassinetti; and I thank the Superior General, Father Amici, for the words he addressed to me on behalf of everyone. I appreciated that in the Convention there was a fraternal collaboration between clergy and laity, with the presence of numerous religious. It is one of the signs of the times of the Church today, but it is also one of the elements that characterized the ministry of the Founder: the promotion of the apostolate of the laity, men and women. I urge you to continue on this path, making your parish and religious communities places where you can breathe a family spirit, welcome, respect and generous apostolic collaboration. This Convention took place about a year after your General Chapter, in which important topics were dealt with. It is therefore a step forward in the commitment to implement the lines that emerged from the Chapter and to make the faithful entrusted to you entrusted with the mission and the charism of the Congregation more and more involved. The Church does not tire of exhorting the religious to a dynamic fidelity to their own charismatic identity, with docility to the Spirit and a strong ecclesial sense. This dynamic fidelity requires constant discernment, which is in turn a supernatural gift (cf., Apostolic Exhortation Gaudete et exsultate, 170), but it also requires commitment, listening, dialogue. The motto of your General Chapter was the words of the Lord reported by the Gospel of John: "By this everyone will know that you are my disciples: if you have love for one another" (Jn 13:35). I encourage you to live the commandment of Jesus more and more as a true badge of your being Christians and consecrated, in the wake of Giuseppe Frassinetti, who cultivated spiritual friendships and promoted fraternity among priests. The Second Vatican Council has clearly and profoundly reaffirmed the universal vocation of the faithful to holiness, rooted in the baptismal call. My predecessors have developed this theme with a wealth of motivation and creativity of expression. There has been talk of the high measure of Christian life, of the need to spread the good life of the Gospel with tenderness, coherence and courage. Among the Pastors who spread the ideal of the sanctification of the People of God in the nineteenth century, Venerable Frassinetti also deserves a prominent place, both for the example of his life and his relationships, and for his rich writings. of encouragement for a humble, serene and courageous journey in the following of Christ. He places at the base of friendship with God the desire to love him and the offering of his whole self to him. It is good, therefore, that you dedicate yourselves to putting the ideals of Frassinettiani to fruition, in everyday life, drawing from treasure of ecclesial spirituality new things and ancient things (cf. Mt 13:52). An important element of your charism concerns vocational commitment, with particular attention to all dimensions of the life of special consecration. We know that it is always God who calls, but we can and must work together to create good soils where the overflowing seed of the call can take root and not be wasted. The Church is also concerned with the solicitude of the initial and ongoing formation of those called, both to the priestly and religious life. In your last chapter this problem has been appropriately dealt with, echoing the great vocational ardor of Giuseppe Frassinetti. I hope that this commitment of prayer, of catechesis, of accompaniment, of vocational formation will always have a privileged place in the life and pastoral care of your Congregation. I would then like to refer to the next Synod of Bishops on the theme Young people, faith and vocational discernment. The spiritual participation in this event, which affects all the faithful, should find you particularly sensitive and collaborative by virtue of the educational and youthful dimension of your charism. Don Frassinetti, like his friend Don Bosco, took the strategic role of the new generations in a dynamic and projected society in the future. I urge you to love the new generations, to make you travel companions on their journey, sometimes confused but full of dreams, which are also part of God's call. Dear brothers, your charism drives you towards some of the crucial challenges of the historical-ecclesial moment that we live. It is important that you are present in this process, without delusions of grandeur but with the desire to do all you can, keeping in heart the evangelical attitude of useless servants. Do not be discouraged by the difficulties of this witness and ask the Virgin Mary to accompany you and the young people entrusted to you in full communion with Jesus Christ. She, Mother of the Church and of each of us, wants to help us to live fully the grace of God and to live as missionary disciples who bear fruit in proclamation, in meeting and in service. I bless all of you and your apostolate, and I ask you to please pray for me. Thank you!